Ceramics in Modern Electronics (with Poliskie, M.), Advancing Microelectronics, March/April 2010, pp. 6-8 (http://www.imaps.org/advancingmicro.htm). Plastics in Electronics (with Poliskie, M.), Silicon Valley Engineering Council, February 2010, pp. 22-31 (http://www.svec.org). Thermal Aspects of LED Headlamps, IEEE Vehicle Power and Propulsion Conference, Dearborn, MI, 7-11 September 2009, pp. 1193-1199. The Chemistry of Halogen Free Electronics (with Poliskie, M.), Advancing Microelectronics, July/August 2009, pp. 22-24 (http://www.imaps.org/advancingmicro.htm). 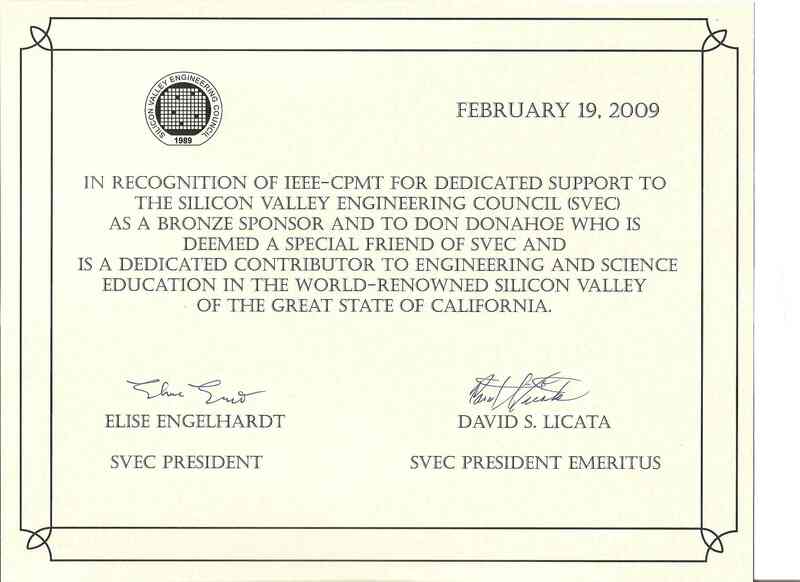 [Editor] Silicon Valley Engineering Council Journal, February 2009 (http://www.svec.org). 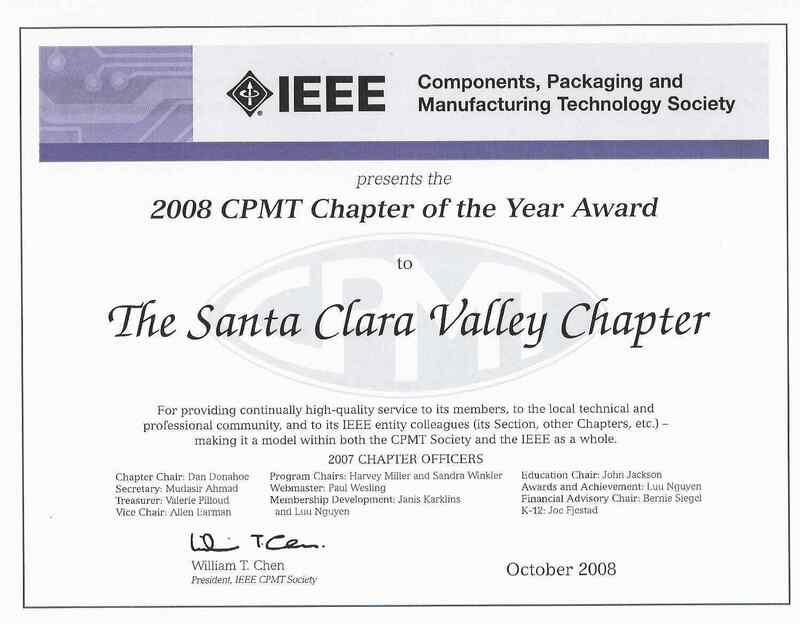 Electronics Reliability, More than Temperature, Continuity, January 2009, pp. 5-7. Accelerated Life Testing (with Zhao, K., Murray, S., Ray, R.), Wiley Encyclopedia of Quantitative Risk Assessment, 2008. Engineers Week: How Thing have Changed Since 1952, UEC, February 2007, pp. 30-35 (http://utahengineerscouncil.org/UECJournal2007FINAL.pdf). Technology Showdown, Utah ASHRAE Annual Sustainability Conference, Salt Lake, UT, 7 May 2010 (http://utahashrae.org/wp-content/links/ASHRAE%20Utah%20050710%20-%20Donahoe.pdf). Economics of Technology and the Engineering Career, Joint Meeting of IEEE GOLD and University of Utah Student Branch, Salt Lake, UT, 29 October 2009. Thermal Aspects of LED Automotive Headlamps, IEEE Vehicle Power and Propulsion Conference, Dearborn, MI, 11 September 2009. Halogen Free Electronics (with Poliskie, M.), Joint Meeting of IEEE CPMT and PES, Sunnyvale, CA, 14 December 2008 (http://www.cpmt.org/scv/meetings/cpmt0812.html). © Copyright 2009 1000 kilometers PLLC. All rights reserved.